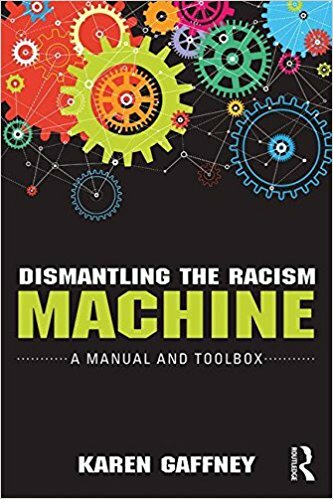 My book, Dismantling the Racism Machine: A Manual and Toolbox, was recently published by Routledge. This book serves as an accessible, introductory, and interdisciplinary guide to race and racism, with tools for action aimed at students, educators, and the general public. It’s available from Amazon here. Description: While scholars have been developing valuable research on race and racism for decades, this work does not often reach the beginning college student or the general public, who rarely learn a basic history of race and racism. If we are to dismantle systemic racism and create a more just society, people need a place to begin. This accessible, introductory, and interdisciplinary guide can be one such place. Grounded in Critical Race Theory, this book uses the metaphor of the Racism Machine to highlight that race is a social construct and that racism is a system of oppression based on invented racial categories. It debunks the false ideology that race is biological. As a manual, this book presents clear instructions for understanding the history of race, including whiteness, starting in colonial America where the elite created a hierarchy of racial categories to maintain their power through a divide and conquer strategy. As a toolbox, this book provides a variety of specific action steps that readers can take once they have developed a foundational understanding of the history of white supremacy, a history that includes how the Racism Machine has been recalibrated to perpetuate racism in a supposedly “post-racial” era. Bio: Dr. Karen Gaffney is a Professor of English at Raritan Valley Community College in NJ, where she teaches courses in composition, gender, and race. She focuses on anti-racism activism in the community, on her blog (dividednolonger.com), and in workshops at the White Privilege Conference and Netroots Nation.